Diana Kennedy doesn't suffer fools. As the world’s preeminent authority on authentic Mexican cooking and one of its best-known food writers, she is renowned for her uncompromising insistence on using the correct local ingredients and preparation techniques. No shortcuts! She has taught generations of cooks how to prepare traditional dishes from the villages of Mexico and, in doing so, has helped preserve the country’s diverse and rich foodways. But she has also proudly stoked a reputation for no-nonsense straight talk. 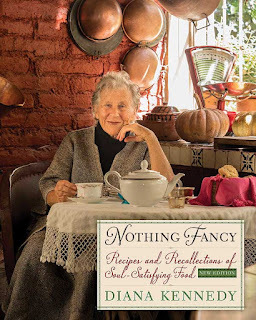 Unafraid to voice her opinions (thank goodness), Diana Kennedy has outlined her many culinary pet peeves—her bêtes noires—in her new book, now back in print after many years, Nothing Fancy: Recipes and Recollections of Soul-Satisfying Food , New Edition. Beyond her bêtes noires, Nothing Fancy is the portal into Diana Kennedy's life at home. The recipes in the book are her personal favorites, from comfort foods to show-stoppers for important guests. Kennedy draws from her childhood in England and her life in Mexico, as well as peppering in a few international dishes from her travels. We've excerpted Diana's brilliant bêtes noires below. In addition to chapters about her life and recipes for her favorite foods, she also covers her culinary addictions and the equipment she simply cannot do without. Enjoy Diana's unfiltered opinions on the proper way to enjoy and promote sustainable food. Nothing Fancy: Recipes and Recollections of Soul-Satisfying Food , New Edition is out now. Now that I’ve been tagged as the “scourge of gastronomy,” I feel all but obligated to scourge away at some of the things that drive me mad in the food world—some of them just annoying and others that are essential to expose as the enemies of flavor. I know, I know, this is the beloved salt of virtually all American chefs, and it seems to be the default choice in cookbooks and food magazines. I find the flavor pedestrian, and ever since it failed me in a corned tongue recipe, it’s been banned from my kitchen in favor of sea salt, the salt of the ancients. For years and years, I seemed to be the only cook in America who wasn’t on board with kosher, but then I learned that the late Marcella Hazan also loathed it, thought it added only sourness to food, and believed it basically ruined anything it touched. She used only sea salt. The various and little-known Mexican regional sea salts are the ones I use for everything. If you’re not used to using sea salt, it tastes saltier, so you can almost always halve the amount of salt in the recipe—but taste afterward to be sure it’s right. Of course I was delighted to find my prejudice against kosher salt endorsed by Mark Bitterman in his authoritative book Salted (Ten Speed Press, 2010). To quote Mark: “Kosher salt is a processed food, with all mineral and moisture qualities intrinsic to real salt stripped away, and with a crystal structure fabricated by automated processes. The flavor is antiseptic, like the bright fluorescence of a laboratory on a spaceship drifting aimlessly away from earth.” And this: “When we cook with kosher salt we sanctify the artificial, we embrace emptiness . . .” Bitterman lists kosher salt as first under Industrial Salts, with a taste of “metal; hot extract of bleach-white paper towel; aerosol fumes” and “best with: marsupial roadkill” (p. 185). And speaking of salt, for some reason the latest generation of bakers seems to have forgotten, or never learned, that you must always include a little salt anytime you’re baking with flour to bring out the maximum flavor of the wheat. I’ve had way too many tarts and pizza crusts that taste flat because the baker skipped the salt. Speak up! Oh please, don’t invite me! That salty sameness throughout is SO boring. Surely it was meant only to preserve meats or fish in a hot climate. I am amazed at the inability of chefs to recognize the difference between true Ceylon (Sri Lanka) cinnamon (canela in Spanish) and cassia, the much cheaper pretender that is not only confused with the real thing but often labeled AS the real thing in the market, even gourmet markets. I can walk through a kitchen door and tell immediately if a baker is using cassia or cinnamon; the difference is that dramatic. Cassia is used in South Indian dishes, and it’s much darker in color, with a harder bark. Sometimes called false cinnamon, it’s usually harvested in China or Vietnam. True cinnamon comes from Sri Lanka in quills, layers of bark, with a much lighter color and a more complex, haunting fragrance. It’s best to grind your own cinnamon, as with most spices, and to acquire it from a reliable source, such as spicetrekkers.com, who stock two grades of true cinnamon. Once you have that flavor in your repertoire, cassia simply won’t do. Aside from the purported health benefits of the canola—of course, there is no such seed; it’s just an invented name for highly processed rapeseed— I dislike both the heaviness of the oil and its flavor. Banned from Quinta Diana. From blue milk to fat-free sour cream, American markets are filled with bizarre dairy products unworthy of the name. It just kills me to read in an ingredient list: ½ cup low-fat yogurt. How on earth will the small amount of dairy fat in half a cup of whole milk yogurt make a difference to your health? It might improve it. After decades of antifat nonsense, at last the science is undeniable that natural fats in their natural state are actually quite good for you—thank God. Not in my kitchen! Now we know the health dangers of Teflon, but are other forms of nonstick any better? Not certified so far, and what’s wrong with using a little tasty oil to grease your pan instead? These little cans full of chemicals spray them in your face and in your food. Why would anyone choose to do that, when you can simply use a little real butter—but not salted, which tends to stick— and then dust the pan with flour, shaking out the excess? Maybe that’s too hard. Banned. For baking breads, I use lard, real lard of course, to grease the pans. 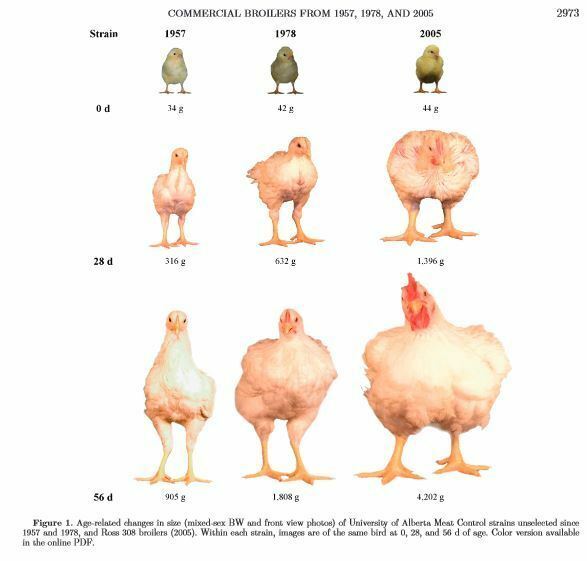 These sad creatures can barely walk, their breasts are so gigantic. They’re shot full of low-grade fats and “broth” to make them seem juicy. The flavorless breasts become perfect diet food—nothing tempting here. Pantries all over America are filled with cans and boxes of “chicken broth” and packets and cubes of bouillon, called for in an emergency to approximate the packaged version. Real made-from-scratch chicken broth is delicious and healthful, the basis of so much good food. In Mexico, no one would dream of tossing out a chicken carcass without simmering it for hours with a few vegetables—and the scraped feet to boot, just like the Chinese! This is free, ecological food of a very high quality, and now it can easily be produced in a slow cooker with virtually no attention. Real chicken broth waiting in the freezer to transform all sorts of dishes is like money in the bank. The commercial versions? Banned. Baked? I say steamed, and it drives me wild that the best part of the baked potato, the lovely leathery protein-rich skin, is lost in the process. Does everyone have false teeth? Aluminum foil: think landfill? A cow has four stomachs to digest them; we haven’t. Gritty greens, salad, spinach, anyone? I’ve been served gritty salad in a five-star New York restaurant, and I know it’s not because no one cleaned the greens. They just didn’t do it properly, gently swishing them in a basin of water, not quickly rinsing them under the tap. Somehow, aspirational Americans have convinced themselves that the very most elegant version of tea is high tea—served with endless fancy sandwiches and little fiddly tastes of this and that as well as too many sweet cakes and cookies. Actually, high tea is a modest supper in England, an enjoyable simple meal with something satisfyingly savory. Afternoon tea, to which I’m addicted, should always be served with a little something sweet— freshly baked scones or slices of cake or cookies. And naturally, with real tea leaves from India or Ceylon or even some parts of Africa, properly brewed in a pot. Tea bags banned, of course. Please don’t greet me by saying “How are you guys doing today?” or calling me “dear” or filling my water glass to the brim without asking, so that the ice cubes reach my nose if I try to take a sip and the water dribbles down my chin. Please ask before filling up—water is liquid gold and becoming more so in many parts of the world, including America. I’m not sure what the point of asking “Is everything okay?” might be, but usually you seem to be fishing for compliments, which I find annoying. I know you mean none of these things to be anything but welcoming, but, like the menu with no prices listed, they have the opposite effect on me. Now don’t be shocked, Chef, if you invite me into your kitchen; I might glance at your beautiful food, but I will fix my gaze on your garbage can. What’s leaving your kitchen tells me a lot about your sensibility and your approach to ingredients. If I find a lot of raw, perfectly usable vegetable scraps mixed with rubber gloves or wads of paper towel; or sheets of aluminum foil and plastic; or used plastic coffee pods trashed after one use (ready to start their several lifetimes in landfills)— I start growling. I’ve been talking about green kitchens and sustainability for many, many decades now. Californian Christopher Kump, son of James Beard Foundation founder Peter Kump, was the first chef I heard about who had a conscience about maintaining a sustainable kitchen, including a solar refrigerator. And as I’ve mentioned, hats off to the late Charlie Trotter, who was a meticulous greenie. In 2013, I delivered a passionate call to arms at René Redzepi’s international chefs’ conference, MAD, which you can see for yourself on Vimeo (“56 Years of Traveling, Cooking, & Writing in Mexico”). I think finally the idea has begun to resonate with young chefs—not a moment too soon—and serious home cooks need to get their act together as well. As it is, we’re playing catch-up to Germany and Japan, which require appropriate and recyclable food packaging. Is it really the mark of a fine chef to seal a single serving of food inside tough plastic, “cook ” it for hours in heated water inside a machine, then serve it forth perfectly done hours later—perhaps with a little invisible sauce of plastic? No thanks. Just think of all those once-briefly-used tough plastic bags going into a landfill, which will eventually leach their chemicals into the drinking water of future generations or irrigate the crops destined for their consumption. If you are devoted to sous vide cooking, remove your supposedly wellearned toque. These send me into toxic shock. WHITE toques, WHITE jackets, WHITE aprons, WHITE towels, WHITE napkins. One little spot, one little smear, and it’s off to the bleach—which kills the water we use, the water we drink, and life in the rivers and streams. Grrrrr. . . . When will we understand that water is our irreplaceable liquid gold? At home or even at the restaurant, the food is often stored in plastic, cooked in plastic, served in plastic, and eaten with plastic utensils—then washed down with drinks in Styrofoam. This chemical lunch is served all over the country every day, in schools and other institutions, supermarkets, fast-food places, even at home. Some is recycled, yes, but in many cases, the plastic will outlive the people who toss it away to its long landfill life. Not to mention the colorful plastic scrapers used to stir the béchamel and other sauces. What happened to wooden spoons, used for centuries but wrongfully pronounced guilty of contaminating our food by the health inspectors? Oh, and can’t you just hear the dull thumping of your best carbon-steel knife on those soulless white plastic chopping boards? If I remember correctly, they were launched into fame by a Chinese chef in the early 1970s in the name of hygiene. NEVER in my kitchen, with all its protective microbes and wild yeasts! People think nothing of wrapping cheese, say, in plastic wrap or putting oils in plastic bottles, but above all you should never let any kind of fat anywhere near plastic—it’s dangerous, and the chemicals in the plastic can easily leach into the food. Now, hands up: Who is guilty of promoting the idea of cooking your Thanksgiving turkey in a giant plastic bag? Okay, some French chefs in the nineteenth century introduced paper-bag cooking, but that was a harmless paper bag. Now we have to scrape that luscious browned skin off plastic and mindlessly absorb the chemicals. Grrrrr . . .
Let’s start questioning those recipe directions that tell us to light the entire oven to a high temperature and then roast one tomato in all this glorious heat. Do as the Mexicans do and roast your tomato on top of the stove on a cast-iron grill. If you’re going to light the oven, you may as well use it for a couple of other dishes as well—or roast something to serve another day. If you must have a self-cleaning oven, ask before you buy it if you can turn down the cleaning temperature a bit. Not only does it waste a huge amount of energy, such high heat also damages the heat sensors in the oven, shortening the oven’s life—and 600 degrees will clean just as efficiently as 800 degrees. Why would anyone want to eat a tomato cloned with fish genes, infected with a chemical that bursts open bugs’ stomachs (and what does it do to ours? ), bred with no concern for its flavor, and capable of polluting crops of native or heirloom tomatoes to the point that they disappear if not very carefully protected? There is almost no corn or soy left in America that’s not GM, so all the corn oils and soy oils used in restaurants are also GM. No choice for the customer who can’t afford organic, in the markets or at the restaurants. Animals are fed these crops as well unless they’re organically raised. Organic has gone from being an appealing choice to being essential if you’d like to eat real food. Where is our Michael Moore of Food? We have allowed the people who create the food they think we ought to be eating to do whatever they like with it. These people have no training in the subtleties of food preparation and, in fact, no qualifications whatsoever, and they’ve simply hijacked the food supply and made fortunes off the hapless public, often with the help of the Dietary Guidelines. Often I feel like Ariadne, screaming and screaming alone on Naxos as everyone else sails off, so outraged am I about what’s happened to our food—such a far cry from what the Founding Fathers, who were all great advocates of agricultural diversity, envisioned for us. But what I’d really like to do is find that Michael Moore of Food and watch him crash the boardroom of one of these bastions of food degradation, thump—or jump!—on the table, and force them all to taste the food they sell us. Then he’d sneak off into their personal kitchens and see what their refrigerators hold: that would be a giveaway if ever there was one. Forget what we see them eating for a “healthy” lunch on camera. I feel sure the Michael Moore of Food is out there somewhere, but may not yet have heard the call. When you do, call me!